Zoho is an online set of applications including a spreadsheet, word processor, database, presentation application and several others. For wikidot wiki users the benefit of Zoho is that you can integrate some of these tools in your wiki and the contents will be updated immediately you update the original at Zoho. This snippet focusses on the Spreadsheet. If you want just a simple table in your wiki, that can be done using the features within wikidot itself. But to include a proper spreadsheet with perhaps charts and pivot tables, or even just views of your data, Zohosheet is a very good free solution and is currently one of the best online spreadsheets. You will need to create an account and can then immediately start to create your spreadsheet. 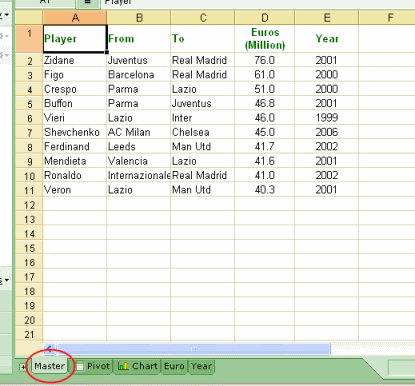 For this example we will use a spreadsheet of football transfer fees in Europe and will show two ways of integrating the spreadsheet into your wiki. After you've created your spreadsheet you can publish it in two ways. The first method publishes the entire spreadsheet to your site and gives you full functionality including the same tabbed sheets, pivot tables and charts that you have in your original. The second method publishes just ranges of your data, that is parts of the spreadsheet or views of your data. You cannot publish pivot tables or charts with this method, just the data, but it has the advantage over the first method of enabling you to put different views of your data on different pages of your wiki. For this example we created a new spreadsheet and added in the data and renamed the tab at the bottom "Master". The only reason for mentioning this is that ithelps to remind a user that data should only be changed on the Master sheet. 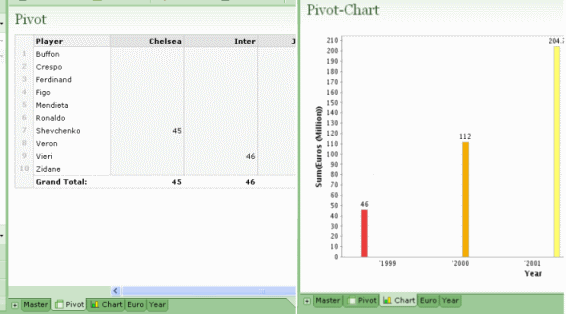 We then created a pivot table showing the total spent by club, and a chart showing the total spent by year. Finally we created additional sheets showing the same data as on the Master sheet but was in transfer fee order and the other was in year order. Each cell in these sheets is linked to the Master sheet using the SohoSheet =Master.A2 formula (for example). We could have put these last two "views" on the same sheet as the master, they don't have to be on separate sheets. The data on these two sheets is not updated manually but updates automatically whenever you change any of the data on the Master sheet. You can click on the different tabs in exactly the same way as on the original spreadsheet at Zoho. It is possible to change the data on the spreadsheet on your wiki although the original data from the spreadsheet at ZohoSheet will be re-loaded next tine you go open or refresh the wiki page. 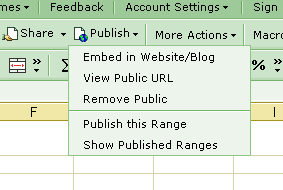 So we recommend you only change any "live" data on the original spreadsheet at Zoho. @iframe src="http://sheet.zoho.com/publishrange.do?id=4fa9d6a05fbf6a13d85b091ddee0296e" frameborder="0" style="height:245px;width:422px" marginwidth="0" marginheight="0" scrolling="auto"> </iframe@. You can't change any of the data unless you go back to your original spreadsheet at Zoho, all it is is a view of the data but it is useful for putting different views of your data on different pages of your wiki. When you want to change any of the data on your spreadsheet, whichever method you have used to publish it, you should go back to the original spreadsheet at Zoho and change the data there. The next time you open or refresh your wiki page you will see that the data has been updated to show the new values. You do not need to re-publish the data, copy new code, update wiki syntax or do anything else - the data in your wiki updates automatically. Users edit or add entries? Is it possible to have it so that users can add or edit entries? Or would that be better done with Google Docs Spreadsheet? … that sort of thing. Not sure if i'm clear?? A very good job. Thanks a lot.